This was a costume from a few years ago. 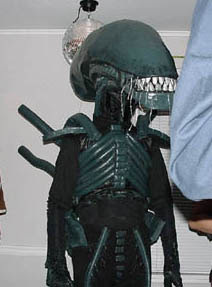 I made the head out of chicken wire and paper mache on an old bike helmet. I found somebody who could sew (she'd worked on the costumes for a play my brother did) to help build the rest of the outfit. My wife doesn't particularly like it. I suppose it's because we'd need to build some "Ripley in the fork-lift suit" so we could be a pair.